The School Profile is something that your counselor will upload to your Naviance account. It will be sent to all of your colleges through Naviance eDocs and will be printed out and included in your mailer for colleges that require students to mail their items to the school. You can download a copy of the 2018-19 CMIT School Profile HERE. Your transcript will be uploaded by your counselor to your Naviance account by early October. It will be sent to all of your colleges that accept electronic documents through Naviance eDocs. In September, you’ll want to double check that everything on your transcript looks accurate. Manually calculate your GPA to see if there is anything you’re noticing isn’t right and if you find something strange, notify your counselor right away. If you took a Dual Enrollment course in the Spring or Summer of your 11th Grade Year, it may not be on your transcript in time for November 1st Deadlines. The county adds these courses to transcripts for all students in PGCPS, which takes a very long time. If a college requires you to mail materials, there will be a little red stamp symbol next to the school name on your Naviance list. If this is the case, you will be required to submit a Transcript Request Form to your counselor at least two weeks prior to your application deadline along with one envelope for every college that requires this. You can download a copy of the Transcript Request Form HERE. Your counselor will prepare a mailer that will include the CMIT School Profile, your Official Transcript, a Secondary School Report (SendEdu Report), and your Letters of Recommendation. This mailer will be sealed once you sign your SendEdu report in person and cannot be opened. You will pick up your mailer(s) and bring them to the Post Office, pay for postage, and send it off! It is recommended that you pay for a tracking number to ensure that it arrives at the school and doesn’t get lost. Most schools require 2-3 letters of recommendation. Do NOT request less than 2 or more than 3 letters. It does not help your applications and letters are sent in the order that teachers upload them, taking away your ability to choose which letters go where. The same teachers are asked by many students to write letters, but they have limited time, so it is wise to ask your teachers prior to the end of your 11th grade year if they would be willing to write your letter. Then, when you return in the fall of your 12th grade year, go back and request these letters again. When teachers agree to write your letter in the fall of 12th grade, you must follow the process below to add your teacher recommenders to your Naviance account. You must do this by the 3rd Friday of the School Year at the latest, but it is recommended you do this right after they agree to write your letter. Select the teacher from the pull-down menu. You can add a personal note if you wish. If you need help with this process, please reach out to your College Summit Peer Leader! Note: your teachers do not need to print out the letters they have written for schools that require mail. Your counselor will print them from Naviance if they have been uploaded by your deadline and include them in your mailer. Your school counselor will write a letter for EVERY senior, however they cannot do so until you provide the requested materials below. Students who want to have their applications in by the very important November 1st deadlines must provide these materials by the 3rd Friday of their Senior Year. Students who miss the material submission deadline will NOT have their letters written by the November 1st deadline. You can download the Senior Questionnaire HERE. Please use this document to type up the answers to the questions being asked of you. The more thorough your responses, the better your letter will be. Make sure to list ALL of the colleges and deadlines you are applying for and answer ALL of the questions. The only question you may leave blank is #11 if it does not apply to you. The rest should have thorough answers (3-4 sentences each). It must be typed and turned in HARD COPY. Electronic submissions will not be accepted. Letters are completed on a first come first serve basis. This item will be partially completed by you and partially completed by your counselor. You only need to fill out the top section that says “For The Student.” This must be typed and EMAILED to your counselor. If you are having difficulty filling out the document on the form, you can email your counselor with the information requested in the box. You can download the SendEdu Report HERE. A resume would be helpful, but is not required. If you choose to submit a resume, it should be printed out and attached to your Senior Questionnaire. Once your counselor has BOTH of these items (the physical copy of your Senior Questionnaire and the emailed copy of your Secondary School Report), they will add you to the list for Counselor Recommendations. These items are due by the 3rd Friday of your Senior Year. Once your Recommendation Letter is written, it will be uploaded to your Naviance account and sent to your schools. Note: Your counselor will print our your letter and include it in your mailer for any schools that require items to be sent through the mail. There are a few steps to beginning your applications. First is to add your colleges to your Naviance account. Next is to see what type of submission your college accepts: CommonApp, Electronic, Mail, or Other. If they accept CommonApp, you’ll have to set up that account. If they are electronic, they aren’t on CommonApp, but they may be on another site such as Coalition or Common Black App. If they require Mail, that will mean additional steps to send in your materials. Step 1: Add schools to your Colleges I’m Applying To List in Naviance. For instructions on how to do this, please read the Naviance 101 document. You must do this step. If you do not list schools in this list, your counselor will not be able to send materials on your behalf. Having schools listed in your “Thinking About” list does not allow your counselor to send documents. Make sure to Select Application Types. Each school will load with a default of the regular application deadline, but you should change that to the Early Action deadline in the drop-down. This will remind your teachers to get their letters in early. You may and should apply to most of your schools as Early Action. You may only apply to one school Early Decision. This is not recommended, but it is your choice. Some schools have programs or scholarships that require that you apply by the Priority (Early Action) deadline. Priority deadlines are not binding like Early Decision. Important: The question mark means you need to do something! If one of your schools has the “Unknown” icon (a question mark), you need to select the type. We cannot send the school materials without this selection. IMPORTANT ALSO: If a school has one of the symbols with a Red Stamp (the bottom two in the above image), you have to MAIL your school profile, transcript, Secondary School Report (SendEdu) and letters of recommendation. This means you are required to submit a Transcript Request Form which can be downloaded HERE. You must also provide the counseling department one envelope for EVERY college that requires you to mail documents. 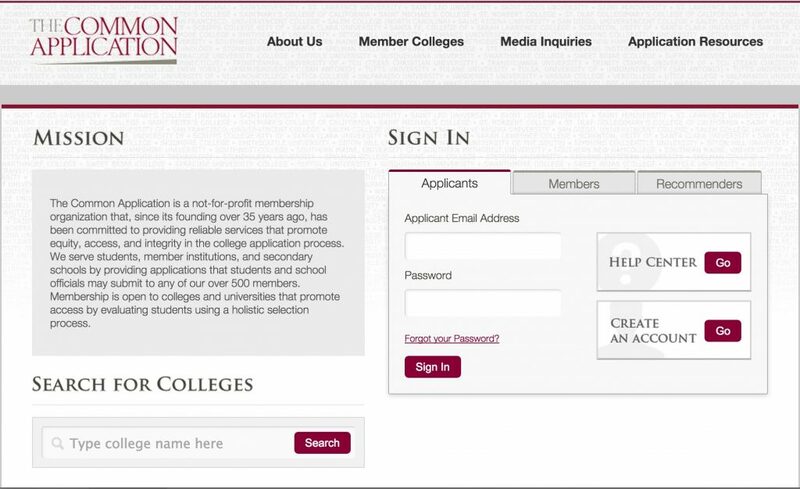 A very large number of schools allow you to apply through the CommonApp, however if they don’t you can also check on the Common Black App (which has most HBCUs) as well as Coalition App. This allows you to submit ONE application for multiple schools rather than using a different website for many different colleges. Check to see which schools are on which websites. If your schools do not use any of these three websites, you will have to complete your application on the school’s individual website. Follow the instructions and apply. You will be able to save your application and complete it in multiple sittings. Even if you apply via the college’s website, you must also use Naviance so that CMIT can complete our portion of your application. Note: if you don’t match your accounts, CMIT cannot send documents to CommonApp schools. Please open the Naviance 101 document (linked below) for instructions on matching your two accounts. You cannot link your Black Common App and/or Coalition Accounts with Naviance, however we can still send documents electronically. When you go on those pages, just make sure to check the box that says that your documents will be sent via another route or platform. There is too much to say about this topic here, so please see the College Essays page under the Counselor tab on the CMIT Academy North website. – Avoid Contractions. Instead of “I’m,” say “I am.” Instead of “couldn’t,” say “could not.” This makes your essay a little more formal. – Don’t use 2nd Person Point of View. – Focus on “showing” rather than telling. Incorporate the senses. – Don’t spend too long on the “what” of the essay. Spend more time on how you’ve grown and what you’ve learned from the topic. The cherry on top is a “why this will make you a successful college student” conclusion. One of the most important things that students need to know is that students are responsible for sending SAT and ACT scores to colleges. CMIT does not send test scores for your applications. For most schools, you must have the testing agencies send your scores. Allow for at least two weeks for official score reports to get to your colleges. This means you should take the SAT/ACT by early October for the last time. If you requested that scores be sent when you took the SAT/ACT (you can choose up to four when you register for a test), then be sure that the schools have your scores. You may not need to pay to send an additional report, but you’ll want to verify that the scores were received by calling the admissions office of each school you sent your scores to. If you did not have your scores sent automatically or a school has not received your scores, you must order score reports from the testing agencies. They will send scores directly to your schools. Again: the CMIT School Counseling department does not send SAT or ACT scores to colleges, and thus you will not find anything about your scores on Naviance. It is the student’s responsibility to send official scores through CollegeBoard (www.collegeboard.org) and/or ACT (www.actstudent.org). Many schools require students to submit a resume or at the least a list of activities and accomplishments. It is important that you really work on your resume to make sure it is strong and does not resemble simply a list of bulleted items. Like the essay component, there is too much to say, so it is encouraged that you go to the Resume page under the Counselor tab on the CMIT Academy North website. – Design is important. You want your resume to have a balance between text and white space on the page. It should look clean and sleek. – Your name should be the biggest thing on the page. You don’t need to put your home address, but you should put your email address and phone number. – Highlight what you’ve accomplished. Don’t just say what you do in a position – emphasize the outcomes of your work. – Personalize the resume for where it is being submitted. If you’re applying for a specific college major, share relevant experiences and courses on your resume.